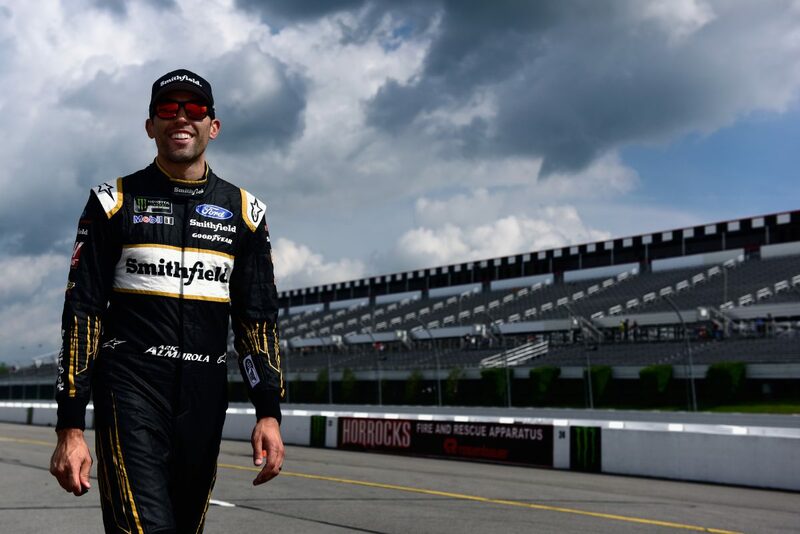 Aric Almirola started Stage 1 in the 34th position at Pocono (Pa.) Raceway and completed it in the 15th spot. After Almirola reported his Smithfield Ford Fusion was loose-handling, the pit crew made adjustments during the only pit stop of the 50-lap stage to address the issue. Before the start of Stage 2, Almirola visited pit road for four tires, fuel and a wedge adjustment to help with the No. 10 Ford Fusion’s handling. He started the second stage in the 19th position and ended it in 17th. Almirola made his second scheduled green-flag pit stop from 14th on lap 73 to get fuel, four tires and adjustments after relaying to the No. 10 team that his racecar’s handling remained loose. The race stayed green until the completion of Stage 2, and the Tampa native ended it in the 14th spot. Before the start of the final stage, Almirola came down pit road for four tires, fuel and adjustments and started the last stage in the 17th position. After the green flag waved, the 34-year-old worked his way up to the 14th position. The third caution came out on lap 125, and Almirola once again visited pit road. A speedy pit stop by the No. 10 Smithfield crew gained Almirola three positions. After the restart Almirola once again worked his way forward and was in the ninth spot when the fourth caution was displayed. Crew chief John Klausmeier made the call for Almirola to visit pit road for two right-side tires. The strategy call allowed Almirola to restart in the sixth position, and he quickly gained one spot to reach the top-five for the first time during the event. The fifth yellow flag waved on lap 147; Almirola didn’t visit pit road and restarted fifth on lap 150. Shortly after the green flag, the caution came out once again, and Almirola was scored in the sixth spot. Almirola was in a sprint to the finish when the green flag dropped on lap 153, and he ultimately finished seventh in the Smithfield Ford Fusion. This was Almirola’s sixth top-10 finish of 2018. Almirola earned his first top-10 in 12 career Monster Energy NASCAR Cup Series starts at Pocono.